Sangam mesmerized its audience at the Library of Congress Wednesday with a performance that won't soon be forgotten. 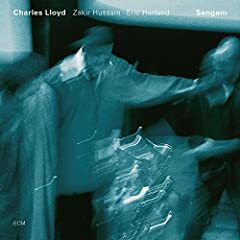 The latest project in veteran jazz composer Charles Lloyd's half-century exploration of world rhythms and harmonies teams the versatile musician with popular Indian tabla master Zakir Hussain and young virtuoso percussionist Eric Harland. Click here for the full review at The Washington Post.